For the last 10,000 years during which human civilization has emerged, the planet has had a relatively stable climate. Carbon embedded in coal, oil and gas has been a major establishing feature of the climate around the world. Since the Industrial Revolution, humanity has been burning those fuels at ever-increasing rates – rapidly returning that carbon to the atmosphere. As a result, we’re on track to heat up the planet by more than 5°C by 2100. That is far beyond the 2°C threshold of warming that scientists and policy-makers have widely accepted as ‘dangerous‘. 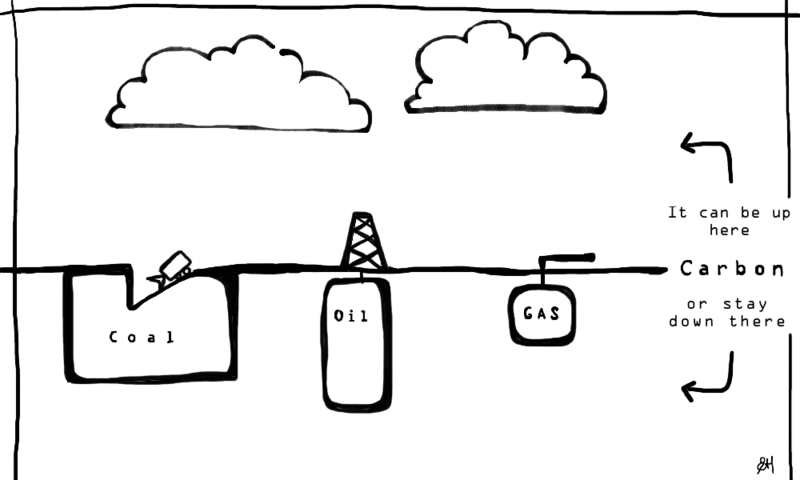 The solution to human-induced climate change is to leave most of the world’s remaining fossil fuels underground. That way, the carbon they contain will be kept in a place where it doesn’t affect the climate. To accomplish that, we are going to need to find alternative sources of energy. Nuclear fission is one of the temporary bridging options. However it has its own issues: it has non-renewable fuel and waste and proliferation problems. Ultimately, though, if humanity wants to power itself in a way that can be perpetuated forever and which does not threaten the climate, we’re going to need to draw the energy we need from renewable sources: hydroelectricity, solar power, wind, tidal, geothermal, and so on. Given how much it would transform our world – and how many human lives that would harm – we need to keep most of the carbon still locked in fossil fuels underground. 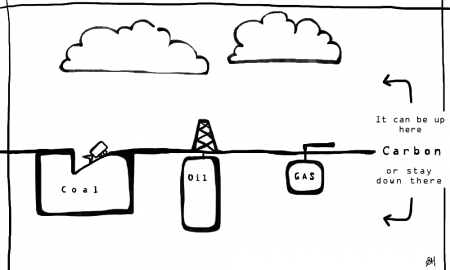 I think this is a great, simple diagram that really illustrates how burning fossil fuels inevitably produces climate change. 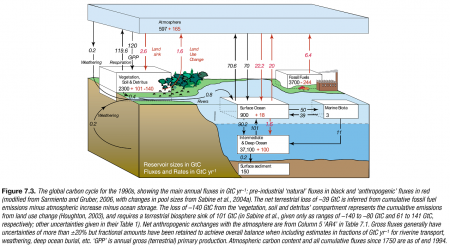 This graphic shows all the natural flows, which is informative but overwhelming. 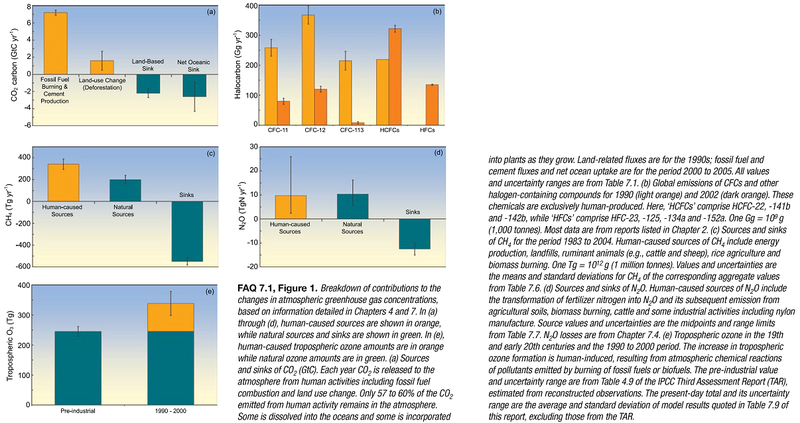 The simple graphic in the post above shows the most important flow being created by human activities: shifting carbon from buried fossil fuel reserves into the atmosphere. 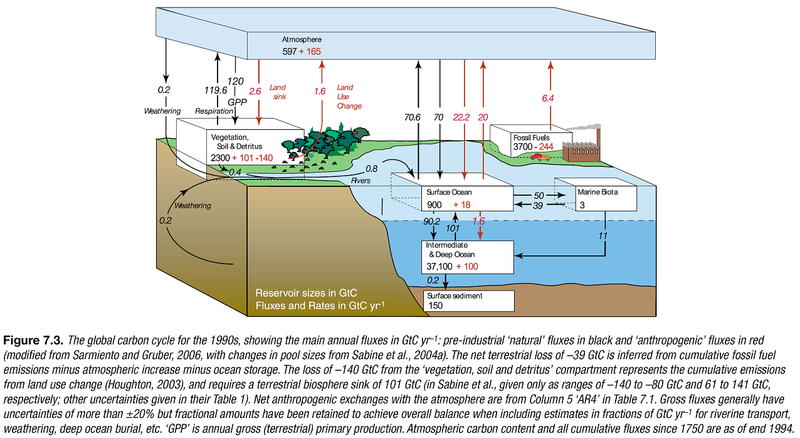 This graphic includes a breakdown of information on different greenhouse gases, showing the role that humanity has played in changing their atmospheric concentrations. Nice, Milan. I like the simplicity of the cartoon. I speak to elementary students about this issue, and will definitely use it. Thx.